Virtually every ultimate player in the world has a forehand and a hammer these days. But it wasn’t always that way. When ultimate began in the late 1960s and early 1970s, no one used either throw. Backhands and overhand wrist flips were the order of the day. So who pioneered the forehand? What about the hammer? Victor Malafronte had a hand in both. A cocky former marine ammo technician from Brooklyn, who won the overall men’s World Frisbee Championship at the Rose Bowl in 1974 and later toured with the Harlem Globetrotters, Malafronte is the father of the modern forehand. Jim Pistrang of Tufts and Irv Kalb of Rutgers learned the throw from him and popularized it on the East Coast, while others, such as Reach Helmka, helped spread it in the West. Malafronte also used the hammer well before anyone else, though Penn State’s Roger Shepard, and Cornell’s Jim Herrick and Paul Brenner are credited with introducing it to ultimate. Malafronte pioneered the forehand after learning it at Berkeley’s Sproul Plaza in 1968, when he was a creative arts student at San Francisco State. He watched a couple of guys named Dave Book and Chuck Pitt throw a standard “sidearm” and also one that was released behind the back. By 1969, he and Stancil Johnson were throwing sidearms at each other in a Guts competition at the International Frisbee Tournament (IFT) in Michigan; Johnson, author of the seminal 1975 book Frisbee: A practitioner’s manual and definitive treatise, had learned the throw during the early 1960s. By the early 1970s, Malafronte had termed his throw the “two-finger macho sidewinder” and was teaching it to others. Kalb, who became the Rutgers captain after graduating high school, and his crew had only heard about the mysterious “sidearm” throw through the IFA’s instruction manual. They attempted it, but when it fell to the ground after 25 yards, they gave up. They also figured it would be easy to block. About this time, Pistrang, who co-founded the Tufts team with Ed Summers in 1972, began experimenting independently with the sidearm. One summer, Kalb, Pistrang, Summers and Larry Schindel, who had also learned ultimate at Columbia High School, attended the IFT, hoping to “spread the Gospel” of ultimate to the Guts crowd. “We were just blown away,” Kalb recalled. Added Pistrang: “I remember that what had the biggest impression on me was his arm motion, the snap he put into the throw, and the speed of the release. 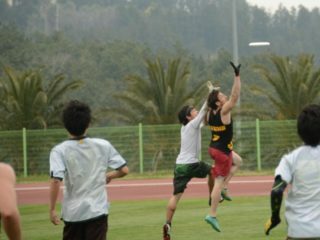 Malafronte later played competitive ultimate in northern California, but never pursued it full-time. Motivated by his meeting with Malafronte at the IFT, Pistrang then began perfecting the sidearm, using it mainly as a short release or dump throw. He is widely regarded as the first to use the forehand on the East Coast ultimate scene. And once Kalb, known as “Dr. I,” began using the forehand, the throw became even more popular. 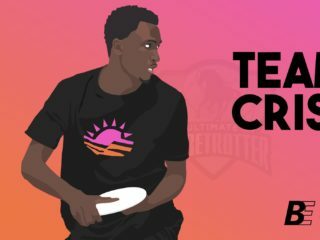 In the West, Malafronte taught the throw to people such as Helmka, who spread it to his San Jose Cling’ons teammates and others within the Northern California Ultimate League, a 16-team conference including teams in California and Oregon. As for the hammer, Malafronte and his partner, John Kirkland, first wowed crowds with it during a 24-minute halftime show at Globetrotter games during the mid-1970s. The duo put their act on in 180 cities in six months, a different city every night. They were even featured in a 1975 Sports Illustrated article. It took several years before the hammer became common in ultimate. Herrick of Cornell suspects he may have seen it at the 1976 World Championships at the Rose Bowl. He then taught it to Brenner in Cornell’s Barton Hall, and eventually to players on Boston Aerodisc and the Rude Boys. When Brenner became a primary handler in 1980, he began regularly using the throw as a zone-buster. The benefit of the hammer, of course, is that the thrower can go over the defense, as opposed to through it, by dropping in a throw almost anywhere on the field. A decade later, Ken Dobyns and Dennis “Cribber” Warsen of New York put on a hammer clinic in the finals of the 1993 Worlds in Madison, Wisconsin. Against San Francisco’s Double Happiness, and in a stadium filled with fans, the two New Yorkers chucked jaw-dropping, full-field hammers over the defense for several goals as New York won the title. Chris Jones, who played at Williams College, is considered by some to have the best pure hammer ever. Jones, who played for New York’s Graffiti and Cojones, has a completely unique style in which his hammer seems to float out in front of the receiver, much like a forehand or backhand. Taro Ramberg, who won two national championships with the Santa Barbara Condors, also possesses one of the most effective, and unique, hammers in the business. A former shortstop at the high school and minor league levels, Ramberg throws a line drive hammer, much like the throw a shortstop makes to first base. Still, Dobyns, Jones, Ramberg and anyone else who throws the overhead must account for the wind, just like Herrick did. Ultimate: The First Four Decades is available now for purchase on Google Books.